Since Lord Gwyn, the first Lord of Cinder, many exalted lords have linked the First Flame, and it is their very souls that have manifested themselves as defender of the flame. The Soul is an amalgamation of all those who have linked the Flame before. It guards the Kiln of the First Flame. When fought, the Soul of Cinder changes weapons and movesets constantly, shifting between various different playstyles. In the second phase of the fight, the soundtrack changes to Gwyn's theme. Use to acquire numerous souls, or transpose to extract it's true strength. 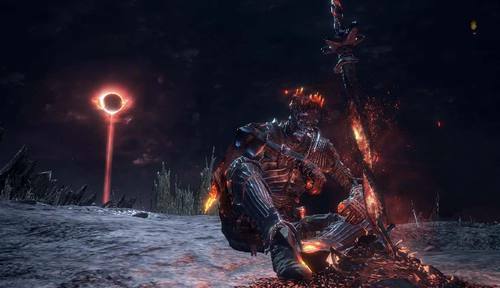 The Lords of Cinder linked the First Flame, and this Greatsword was wielded by their deific manifestation. This coiled sword, found thrust in the bonfire, existed long before the throneless lords themselves. Skill: Ember: The fading flame momentarily illuminates and launches itself forward. Helm of the Soul of Cinder, a deific manifestation of the Lords of Cinder, who linked the First Flame. It resembles a knight's helm, but bears hideous burns and contortions. A mishappen crown can be seen upon its rear. It exists as a symbol of the great Lords and the noble act of linking the fire, though it is no more than an empty husk. Armor of the Soul of Cinder, a deific manifestation of the Lords of Cinder, who linked the First Flame. It resembles a knight's armor, but bears hideous burns and contortions, taking the shape of a deathly ribcage.